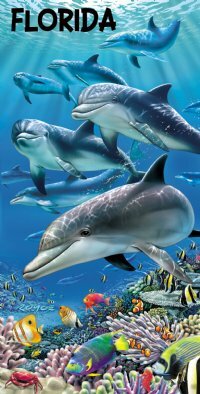 The Living Sea - Florida beach towels wholesale with Dolphins playing with reef fish in the blue ocean measures approximately 30" x 60". 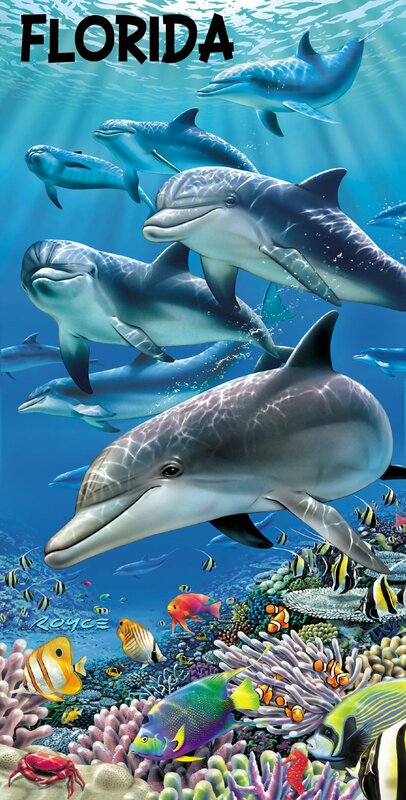 These wholesale dolphins playing with reef fish in the blue ocean towels are named dropped "Florida". Fiber reactive dyes form permanent covalent bonds with the cellulose fiber in cotton. This enables the towels to stay bright for years. Fiber reactive dyes are permanent dyes. Unlike inks, they do not rest on the fabric or coat the fabric; they chemically unite with the molecules that make up the fabric. They become part of the fabric. .